A.J. Currie, Acton Free Press (Acton, ON), 18 Jun 1975, R4-R5 The large stained glass window in Union Presbyterian Church faces 22 Sideroad at Winston Churchill Blvd. A.J. 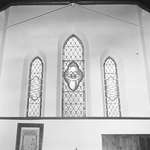 Currie, Acton Free Press (Acton, ON), 18 Jun 1975, R4-R5 The back window at Knox Presbyterian Church faces Main Street.